Any idea what this skull might have belonged to? You can put your questions, comments and suggestions below and I’ll do my best to respond. Good luck! Not M.c but a close relative – good spot! Ah. I’ve just seen the ..B. I wouldn’t fancy one of those loose in a boat! wow! that’s a though one I think. 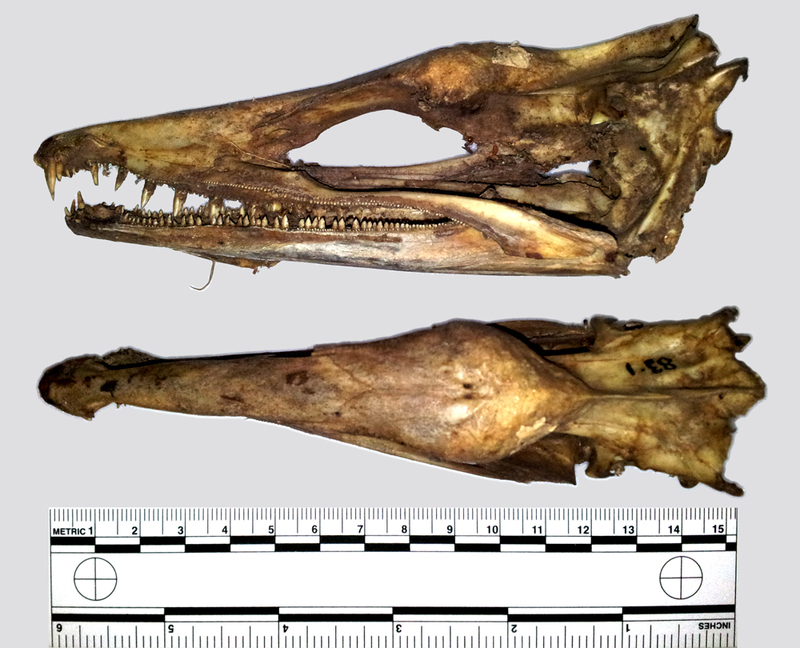 Is it a reptile skull, looking at the teeth? But it is rather large. I found a similar skull but only the jaws looks similar. that was a lizard that looked like a snake. o, cool. the cranial part didn’t fit, but it doesn’t look mammal either. I can’t help feeling that the identification lies with those distinctive bottom teeth. I believe this animal lives in the sea,is long bodied, and is kind of named after a weapon. Could be – but there are several critters that would fit! Order: Sounds like a Carribean island (not Caiman); Family: common name is a fresh-water fish (spikey); Genus: no idea. From the other clues I guess this one’s in the bag? Is it an M… B…? Or are you just piking fun at us? Change the B to a C? Ignore that last one- posted without reading. M.C.s Australian relative? It’s great to be back on line. We moved house and its taken two months to get a phone line connected. Good call and good to have you back! Just like to say I have no idea what this is and all the clues sre far too cryptic this week. The long tapered shape and teeth made me think that it has a long narrow body similar to a caiman. The “not a reptile” had me stumped. I figured it out when the long body stuck its head out of a burrow and tried to bit me while I was snorkeling. It was almost electrifying, but not quite. Wow! I got this one without looking at the comments! I first thought lizard, or fish. Ruled out lizard quickly, then ID’d this handily based on what I know from local relatives here in the Eastern Pacific. Very cool specimen. I always do better with skulls. Thanks!